Waistlines aren't burnt in a day. Fake it until you make it, with these posture tweaks. Spine: Stand with your back to the wall. Your shoulder blades and backside must touch it, with your mid-back slightly away. Hold this shape at all times. Glutes: Many people who spend hours sitting lack proper glute activation. 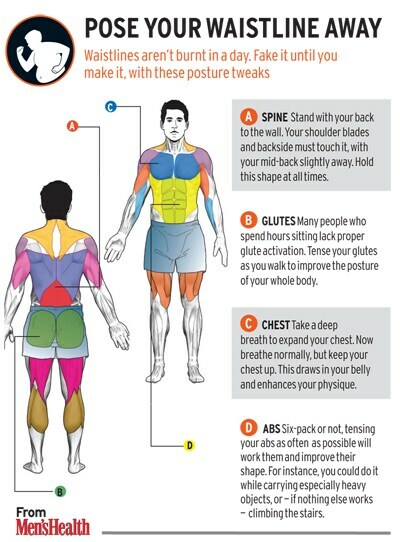 Tense your glutes as you walk to improve the posture of your whole body. Chest: Take a deep breath to expand your chest. Now breathe normally, but keep your chest up. This draws in your belly and enhances your physique. Abs: Six-pack or not, tensing your abs as often as possible will work them and improve their shape. For instance, you could do it while carrying especially heavy objects, or - if nothing else works - climbing the stairs.